Tourney director Tom Schotte wrote a day prior to the tournament: "Done and wasted... too much to do, too little time. Good luck with the EGP fellows, I'm out #CRASHED". Nicky van den Biggelaar stopped Toms winning streak in round 6, a 44-20 win for Nicky. Great day for Nicky with a winning streak of seven as he finished day 1 with a 19-45 win against Marc Tastet in round 7. 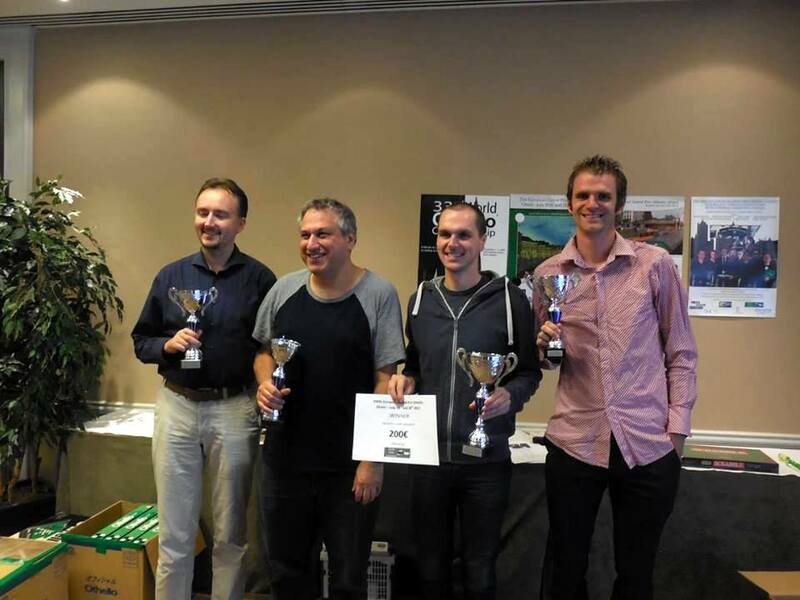 The top 4 players of the 2017 EGP were all present at this stage in Ghent. Imre Leader scored 6/7 (a loss in round 3 against Nicky). Matthias Berg and Marc Tastet scored 5/7. Matthias lost against Tom in round 4 and against Imre in round 7. Marc Tastet started with a loss ( against Imre) and finished with a loss (against Nicky). 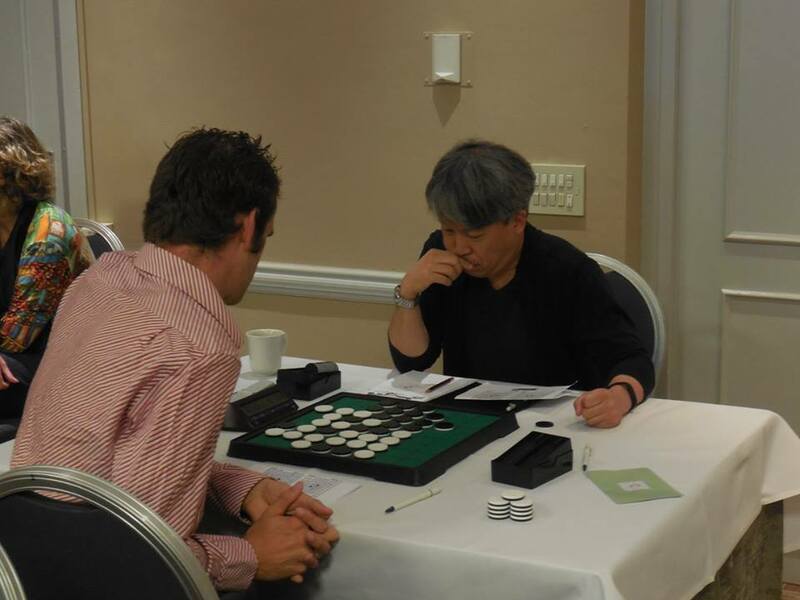 Takuji Kashiwabara scored 4/7, he lost against Matthias in round 1, in round 3 against Anja van Gimst (this is not the first time she won against Takuji at an EGP!) and he lost against Roel Hobo in round 5. Which of these 4 will lay his hands on those highly valued 200 points? We'll see tomorrow. Weirdest game of the day: HASSAN Ahmed 3-61 VERSTUYFT Jana in round 5. With only 20 discs on the board, no move for black! SCHOTTE Tom 39-25 DE GRAAF Jan C.
Another win for Nicky van den Biggelaar in round 8 but in round 9 Matthias Berg defeated him. With 2 more wins for Imre on day 2, Imre and Nicky shared top position after 9 rounds, with Matthias and Tom just 1 point behind them. I watched 2 games in round 10 and Takuji Kashiwabara - Kunihiko Tanida was a game with a twist. Takuji was way ahead in the game and things went bad at move 47. Very exciting was the Roel Hobo - Matthias Berg game. A nice win for Dutch Othello Federations president Roel Hobo. 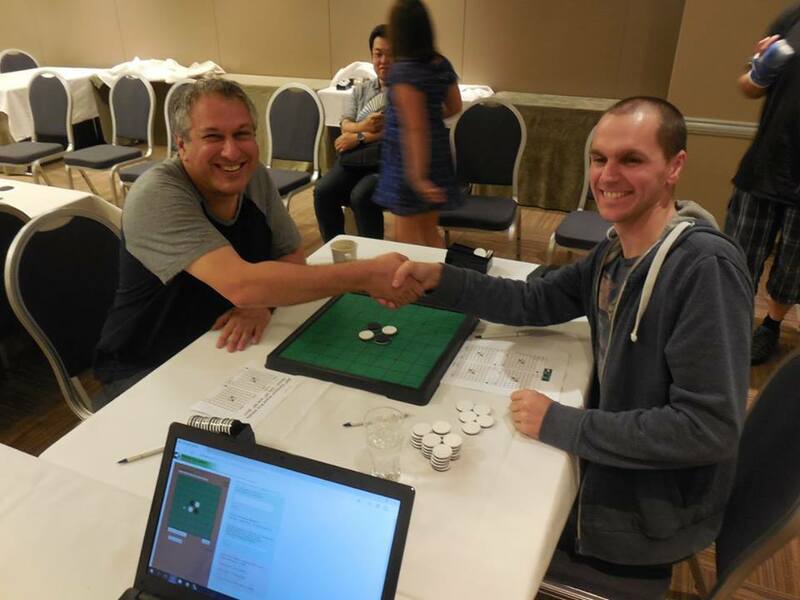 Nicky won his game in round 10 and Imre lost to Albert Kortendijk. 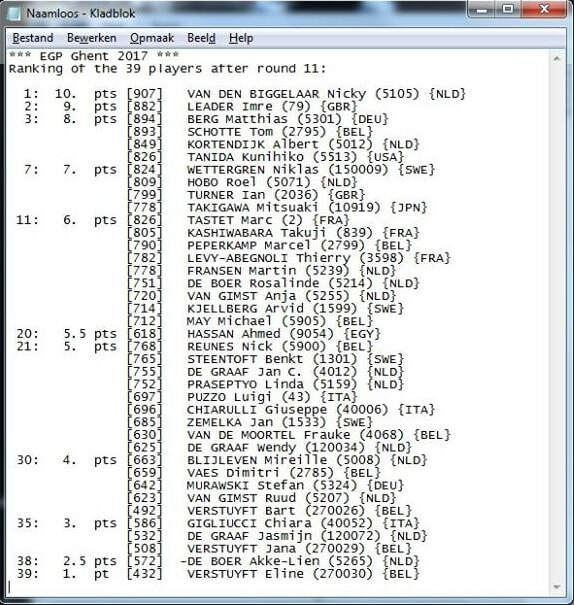 Top 4 with 1 more round to go: Nicky van den Biggelaar 9/10, Tom Schotte 8/10, Imre Leader 8/10, and 7/10 for Matthias Berg, Albert Kortendijk, Roel Hobo and KunihikoTanida. 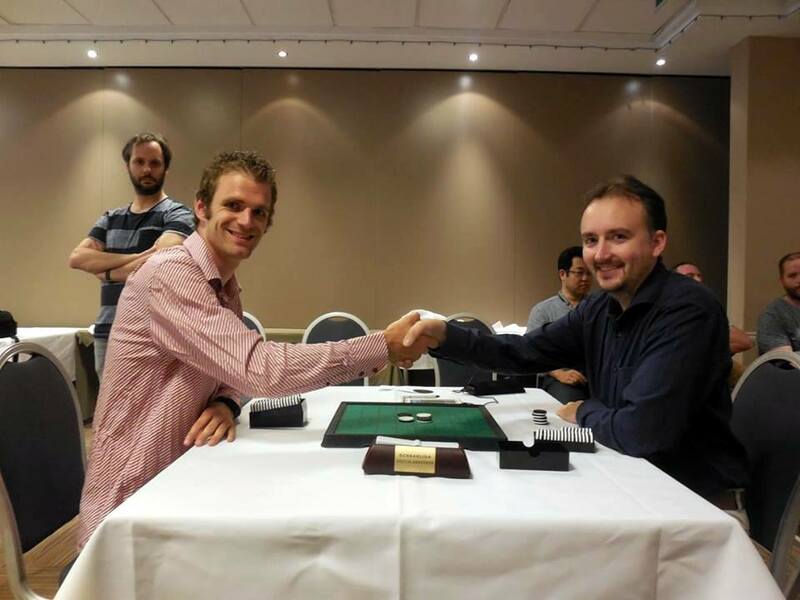 Matthias Berg won against Marc Tastet in round 11 and finished with 8/10. Not enough for a spot in the final as Imre Leader also picked up another point. Tom Schotte lost in round 11 against Tanida Kunihiko. There will be no Belgian Championship final played as Tom Schotte finished in top 4 and by doing so secured his 9th Belgian Championship. Congrats Tom! Happiest player after 11 rounds? I bet that was Wendy de Graaf. 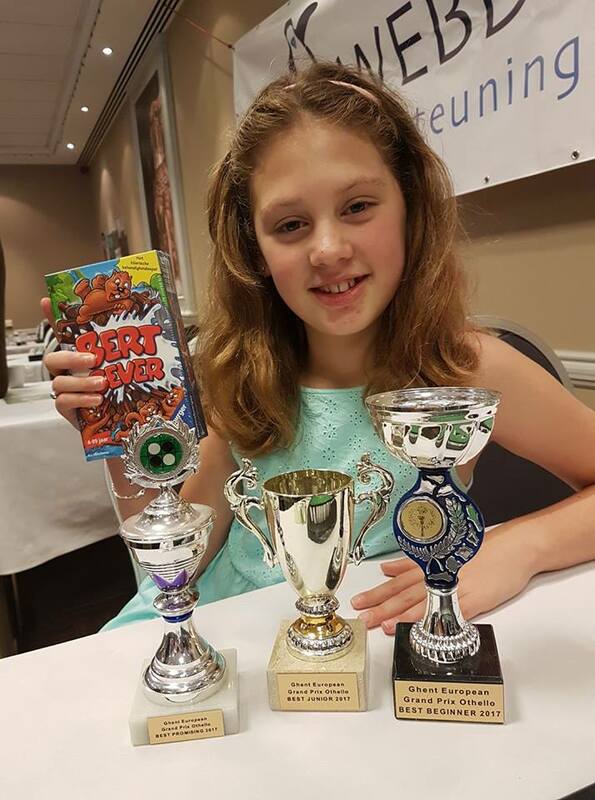 This was her first European Grand Prix tournament and she went home with three trophies: Best Promising, Best Beginner and Best Junior! three trophies for Wendy de Graaf! 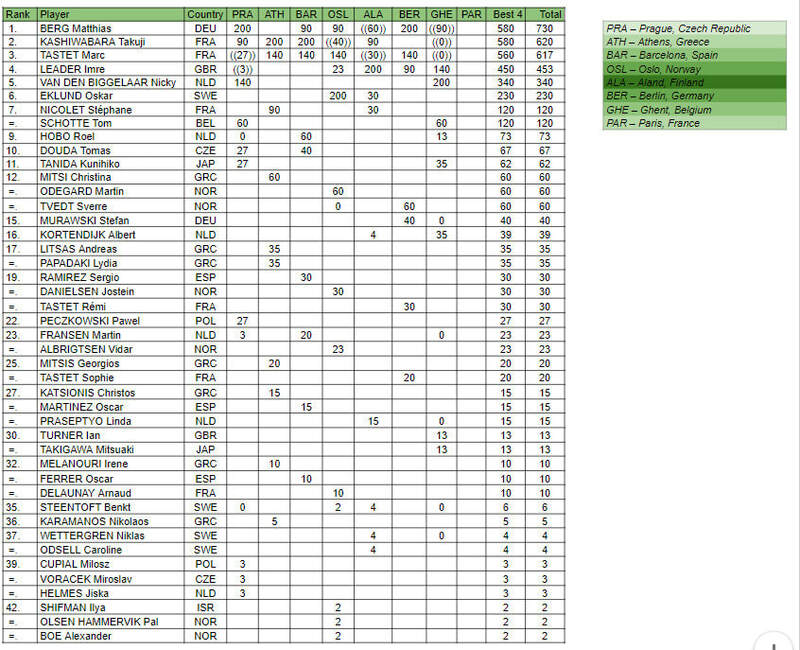 ​The playoff for 3rd/4th place was won by Matthias Berg, an important win for him for the overall EGP championship especially as his closest rivals, Takuji Kashiwabara and Marc Tastet did not win any EGP points . 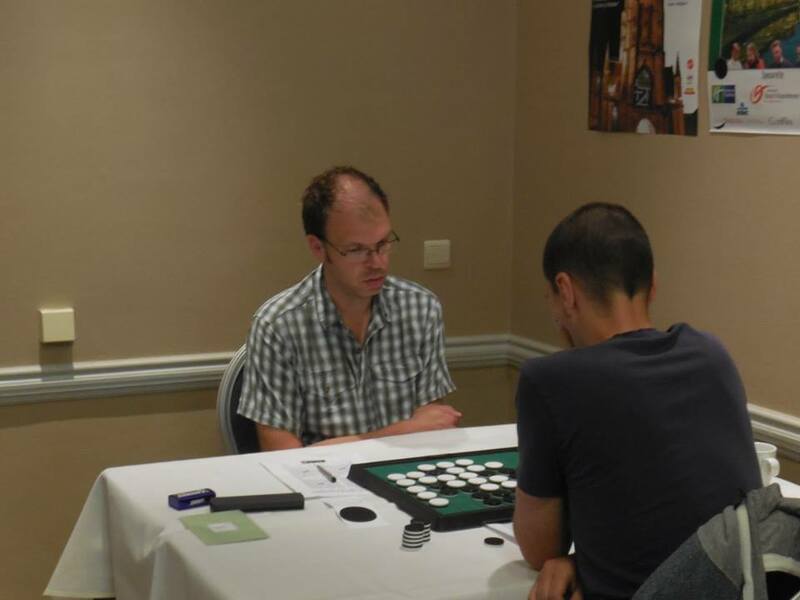 ​The tourney win, 200 EGP points and €200 went to Nicky van den Biggelaar in a 2-1 final against Imre Leader. Nicky won the previous Ghent EGP in 2015. 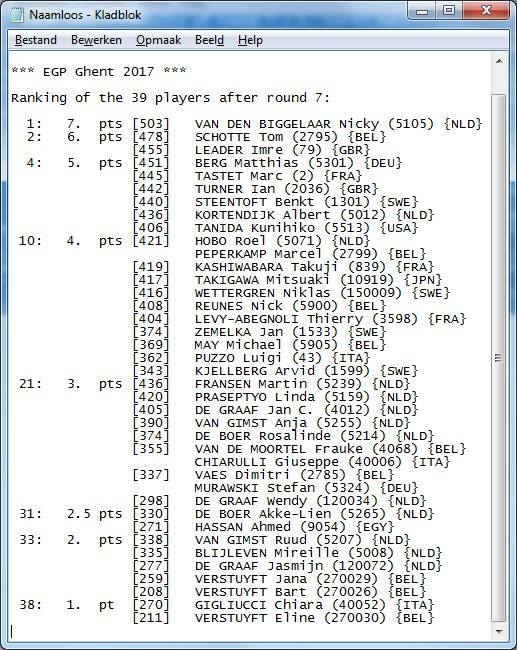 This year Nicky played in only two EGP's, this one in Ghent and in Prague where he lost in the final against Matthias Berg. For the European Grand Prix 2017 Championship, Imre did just what was needed to be still in the race, which means that the final EGP stage, Paris August 26-27, will see the definitive battle for the 2017 EGP Championship between Matthias Berg, Marc Tastet (4x champion), Imre Leader (5 x champion) and Takuji Kashiwabara (10x champion). ﻿The 23rd edition of the European Grand Prix tournament on Belgian soil will take place on Saturday 29th and Sunday 30th of July 2017. The tournament is the 7th stage of the 2017 European Grand Prix season and promises once again to be a great event. This tournament will be counting for the ﻿Belgian Grand Prix 2017﻿ and the Foreigners Grand Prix 2017. 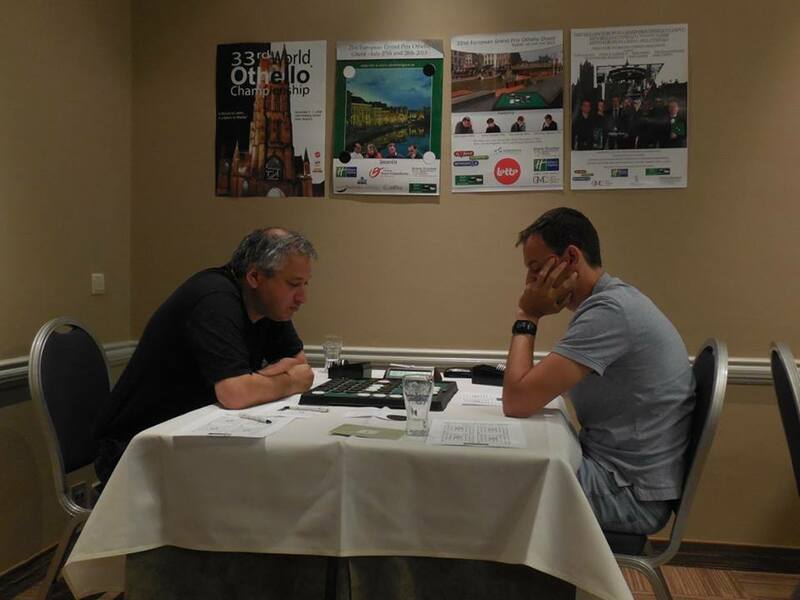 On top of that this tournament will also be the 34th Belgian Othello Championship. All results will also be transferred for the World Othello Rating List. The tournament will be held in cooperation with Gent Meeting Center, the event center that also assisted in the organisation of the European Grand Prix events in 2013/2015 and the World Othello Championship 2009/2017. 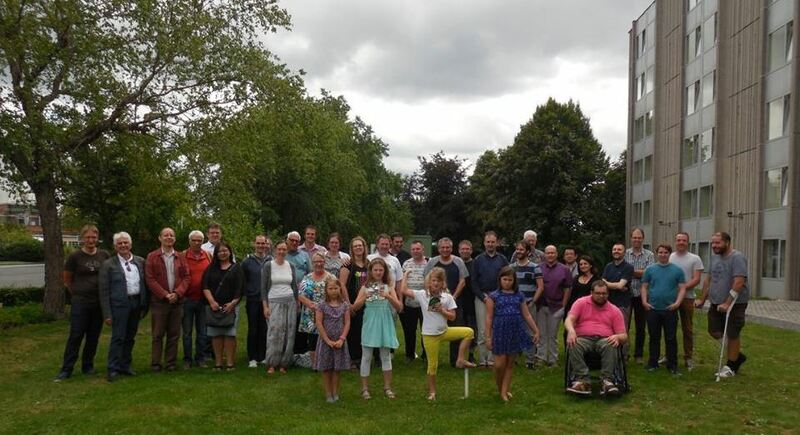 The tournament promises to have a WOC level organisation once again! 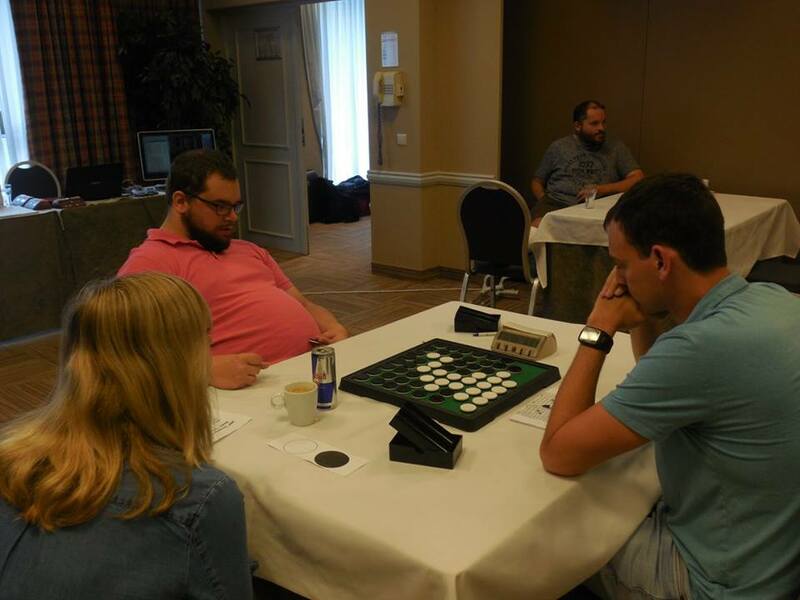 The Belgian Othello Association foresees more than 800€ prizes spread over all categories and we are intending to have a winners fee of 200€ to celebrate the 200th tournament in European Grand Prix history. Lunches and drinks during the day will be included in the entry fee. There is a reduced fee junior players (15€) and there is a reduced fee for lower rated players as well (30€ instead of 50€). 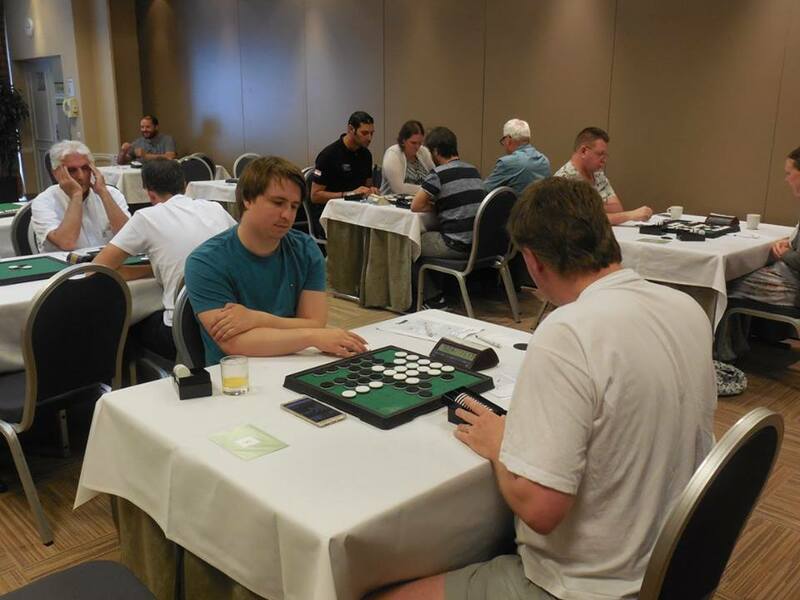 In 2015 the event hosted no less than 41 players who competed for victory. Nicky van den Biggelaar (NLD) won in a final against Jeroen Everts (SWE).